Don't leave your friends and family behind when you hit the road. FMCA makes it easier for you to work and play from the comfort of your RV. Maybe you work full-time on the road, or maybe you just want to be able to upload your travel pics online. Whatever your RV internet service needs, being an FMCA member can save you money. FMCA has negotiated these special RV WiFi deals just for members. "I am very pleased with both the Franklin R-910 Hotspot and the Sprint unlimited data plan. Everything is working flawlessly." Unlimited Sprint Mobile Internet + More! No matter where you go, stay connected. Data limits on your cell phone plan? No problem! 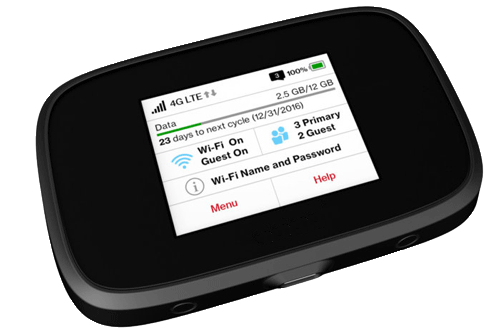 Connect your Sprint-powered hotspot and share your journey. FMCA has teamed with Sprint to bring its members an outstanding benefit. The Tech Connect Plus package includes 3G-4G LTE as a truly unlimited monthly service. Access to this benefit package is just $49.99/mo with a one-time device rental fee of $39.99. Get a Verizon mobile hotspot for only $0.01 (that’s right, a penny!) with a 2-year agreement when you sign up for the $49.99/month Verizon Mobile Broadband Plan (plus applicable taxes and fees). Enjoy up to 25GB of high-speed data each month. Use the jetpack at home. While you travel. Anywhere you need fat, reliable internet access! "Today, I completed the steps to use my existing Verizon hotspot and increase my data cap, while cutting my monthly cost in half. Thank you FMCA!" Canadian members are welcome to purchase the plans for use in the U.S. Please note Verizon and Sprint would apply additional charges for use in Canada. A U.S. shipping address must be provided to receive the device and special arrangements may need to be made if the billing address differs from the shipping address. Take Advantage By Becoming A Member Today For Only $60!